They say there is nothing new under the sun, and obviously, by the same token, some of Zambia’s most influential artists have been experimenting with scrap metal as a medium for decades. Henry Tayali’s Bull at Galaunia Farms along the Airport road in Lusaka, William Miko’s Future Car at the Lusaka National Museum and Martin Phiri’s many works in several collections in Zambia and abroad is testimony this. So, it should not be a big deal if 33-year-old sculptor Joseph Shakulipa has made working in this medium his main stay. However, there is something about Shakulipa that separates him from all his forerunners. Unlike them, he has barely seen the inside of a classroom whereas they remain among the most educated Zambian visual artists to date. The late Tayali obtained a BA in Fine Arts at Makerere University as early as 1967 and followed it up with an MA degree from Staatliche Kunstakademic in Germany. Miko has both a BA and MA from Middlesex University in London, while the late Phiri obtained a BA Fine Art degree from China in 1985 and later mobilized his colleagues to form the Zambia National Visual Arts Council (VAC). “I started art in 2006, after I was encouraged by my master Charles Chambata. Before I started art I used to do any other job to make money. I used to be an ‘eagle-eagle’ (Zambian slang for hawker), I was about 19 and I used to sell oranges and then later became a garden boy in Olympia Park, but then I returned and the street because you know I didn’t get an education because I was moving from step father to step mother, just being kept by people” narrates the former street vendor whom through Chambata managed to sneak a sculpture into the prestigious National Exhibition at the Henry Tayali Gallery from where Ngoma Award Finalists are selected. The same year he launched his career, 2006, Shakulipa was nominated as a finalist for the awards. 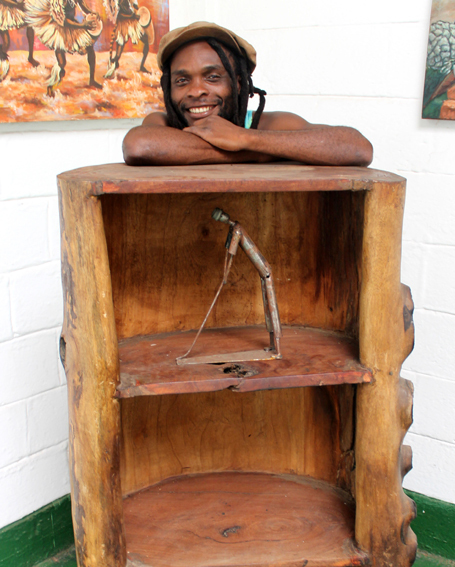 “Charles is not a jealous or selfish person he started putting my works in exhibitions because it was not easy if you are a non-VAC member, I am very thankful for him to have confidence in me and give me a chance to prove myself”, says the dreadlocked artist commending his ‘brother man’ and fellow Rastafarian. He explains that during his time as a street hawker outside the Manda Hill Mall he would sneak into the nearby Lusaka show grounds to see Chambata at work. When Chambata, also from Garden Compound noticed the enthusiasm in his friend he invited him to become an apprentice, allowing him to sand and grind some of his works, which are mostly in wood. “When I became Charles’s assistant he returned to Garden (compound) but I knew I had some creativity inside me, in fact I sold my first works to Fr. Olinto at the Pope’s Square, I earned about K500, 000 (five hundred thousand kwacha) which was a lot of money for me at the time, I was used to small money as an eagle-eagle,” says the artist who now enjoys commissions from the Farmers Union as well as collectors such as former bank governor Caleb Fundanga . After he discovered his creative streak, he started earning some money and later found a space at the Arts Academy Without Walls (AAW) in the Lusaka Showgrounds. 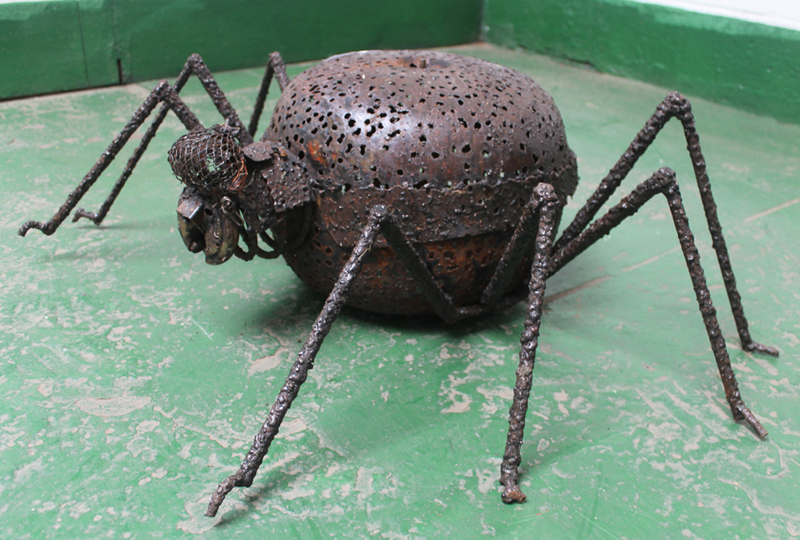 By now he was in the habit of collecting discarded metal objects and hoarding them at his work space until he thought of creative ways of turning them into art. “Right now I do not miss my street vending days because I am making a bit of money to feed my family and I was able to buy my own power tools like a grinder. Although I still intend to but a welding machine of my own because right now, the welding machine at the Visual Arts Council is broken so I have to hire,” explains Shakulipa. 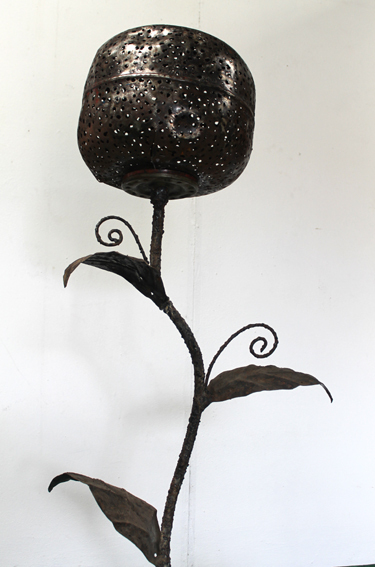 Much of the artist’s work is left in its rust-coated unrefined form, much like that of the late Martin Phiri. 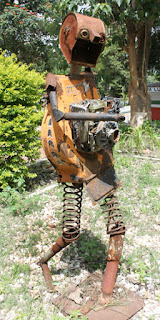 He is not in the habit of giving his work a coat of glossy shimmer as can be seen in the works of other artists who use this medium such as Eddie Mumba or Jerry Kapungwe Miko with whom he exhibited in a show that was entitled Recycled. In fact Recycled which focused on the environmental threat and artistic diversity is one of Shakulipa’s career highlights. In 2008 the exhibition opened in Norway and featured six other artists from across the African continent including the internationally acclaimed Ghanaian sculptor El Anatsui who has been teaching sculpture among other things at the the the University of Nigeria, Nsukka since 1975. Nevertheless, in 2012 Shakulipa’s work was featured on the Grant Thornton desk calendar. He has also had an individual show at the Alliance Francaise in Lusaka and has exhibited in several group exhibitions at the Henry Tayali Gallery. Last year he exhibited with children at the International School of Lusaka, Portico Restaurant and Mary Immaculate School. These remain exciting times for the artist; his art was recently commissioned by a Dutch NGO, through the help of his friend a medical doctor and fellow artist Dr Jack Menke, 3 of his works were shipped to Amsterdam for permanent display in February. Shakulipa’s story is nothing but inspirational, regardless of his beginnings he is a real artist, he lives the life and the struggle. Instead of sitting down and crying for help like many youths, he took it upon himself; through scrap metal, discarded wood and hard work he feeds his wife and four children. 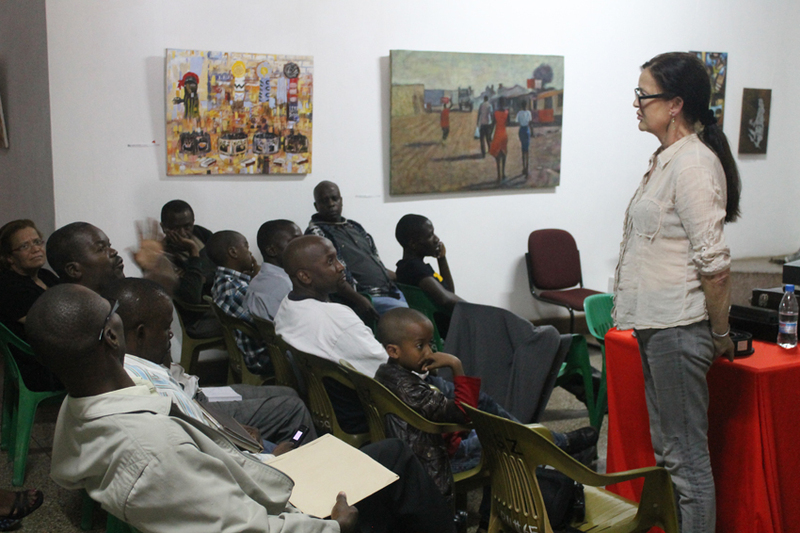 Accomplished Canadian visual artist and academic Wendy Dobereiner, a visiting professor in the Zambia Open University (ZAOU) Fine Arts department said she was thoroughly impressed at the quality of work by Zambian visual artists. Dobereiner, applauded Zambian artists while delivering a lecture on different aspects and periods of her work as a practicing artist at the Henry Tayali Gallery in the Lusaka show grounds recently. “One of the good things about an artist is that what you are responding to is your own personal reality in relation to the culture that you are in or the gender that you are in,” said the artist, predominantly a printmaker who taught at the University of British Columbia for 21 years. She introduced the audience to a broad range of etchings, drawing and mixed media posters of her past works, some inspired by personal experience and some a manifestation of her political edge. The beginning of her presentation however, a series of prints made from girdles, corsets, bras and every manner of female underwear revealed that she was a very strong advocate of the feminist movement. “When I first started making art I fell in love with etching and for me it was all about the change of the female body, this in a way was at the beginning of the feminist movement which at that time was a monolithic concept, but nowadays it is splintered up into many groups, like separatist feminist, Marxist, liberal feminism,” she said. For the uninitiated, the feminist movement is the production of overtly feminist artworks that dates from the late 1960s onwards. It involved a whole range of issues including a re-examination of history from a feminist viewpoint, a reversal of the historical bias against crafts as opposed to high art, and the creation of women’s art groups, institutions and galleries, well that is according to the Oxford Concise Dictionary of Art Terms. “I started thinking about the way that women change their bodies and curl or straighten their hair. But then I went out of that field of discussing female issues and what sort of constraints had been placed by wardrobe,” said Dobereiner as she changed her slides to a series of large scale pencil drawings that she made during her time in Paris at Cite des Arts while on a scholarship from the Royal College of Art in London where she was studying for Masters in Fine Art in the late 1970s. This series of drawings was in fact a combination of work from Paris and London, whereas the Paris drawings are more light-hearted, the latter works are more politically inclined, in them are images of early and late 1970s politicians such as Nixon, Carter and Thatcher. “But after I got a scholarship to Paris, there was no etching facility, so I started to think of a pencil like a computer or like a simple tool you can carry anywhere. I started drawing very realistic work. I really wanted to defame the camera and to be able to make things look realistic,” she said. “You can imagine how pain staking it is to draw anything realistically,” she added pointing at a skilfully executed, multifaceted drawing of former US President Jimmy Carter whom she said she admired dearly because he is “the only US president in a very long time where America was never involved in a war”, her words and work on Nixon and Thatcher were however not too kind. And one of her drawings critical of British white supremacist party, the National Front that reached the peak of its popularity in the 1970s depicts the Union Jack (British flag) being sucked down the drain along with prominent members of the party. She also explained how the media, particularly newspapers, had a large impact on her work while she was in the UK. “We didn’t have too many good newspapers in Vancouver so I got fascinated by the news, not the content so much but the way things were imaged like Jimmy Carter was always imaged with a smile… I really liked the surface quality of the way newspapers work,” she explained and pointed at a work she did on Thatcher. She explained that the last drawing in this series was so realistic and it was all about being able to read the news or watch it on a plasma TV in the comfort of your home. Something she found very disturbing in a sense that one can read about it (bad news) and feel it but then how close is one really to it? Dobereiner’s seeking for social solace in a Laundromat back home in Canada after she left the UK with its popular ‘pubs’ where people go to discuss everything from politics to scientific discoveries over a pint of beer is not unique to her part of the world. In a number of areas in rural Zambian, it is said that women are shunning the hand-pumped boreholes sunk at the centre of their villages because they would rather walk a few kilometres to a stream as this is the only time they can discuss social issues away from their husbands and men. An outing to draw water at the river is their social space; here they can discuss their women’s secrets freely. Nevertheless, Dobereiner’s images from the Laundromat developed into a domestic care series with huge mixed media works composed of reclaimed domestic objects, paints and Plexiglas with titles such as Washing the dishes, Smitten Oven Mittens and The Seven Maids Swept for Seven Years. Most of these works have vivid colours and frantic brush strokes in stark contrast to her London-Paris pencil drawings. Some of the works have actual ironing boards and mops screwed onto them. These works were shown in New York and were well received except Dobereiner observed a few things about the way viewers behave in a gallery and the way present day portraiture has evolving. “I sat there and it was really an epiphany in terms of teaching, you have some people when they walk into a gallery they look around, but don’t actually ‘look’, and if you are not looking then you are not understanding, somehow. People want tightly edited MTV type viewing and just take photos,” she explained as she pointed out the slide of a man who was not really looking at her work in a New York gallery as he seemed to be facing the wall, almost in the posture of a man urinating against it. “This one is the universal woman, it is extraordinary how I’m finding with social media like Facebook for instance that its not about portraiture anymore its about self-imaging, you don’t put a picture of yourself up like a portrait anymore… its interesting,” she said showing the last of her slides in this series which is a version of Leonardo Da Vinci’s famous Vitruvian Man, or in this case Vitruvian Woman. Again here, she does have a point with Facebook. Anyone on this social network has seen the popular ‘mirror shot’ photos, in which mostly young girls and occasionally older women point their mobile phones into a mirror after returning from a beauty salon or while wearing clothes that leave nothing to the imagination. Clothes they would not dare wear in public. These are mostly taken in bedrooms and nightclub toilets and then posted as their Facebook display photos. Similarly young men will take photos of their ‘six-packs’ showing-off their abdomens after several gym sessions. It is almost impossible to find a passport-type portrait on Facebook, and like Dobereiner puts it, it is all about self-imaging. Dobereiner also discussed her poster series, much of which was inspired during her one year sabbatical leave in Italy after she was mugged by two men on a motorcycle. 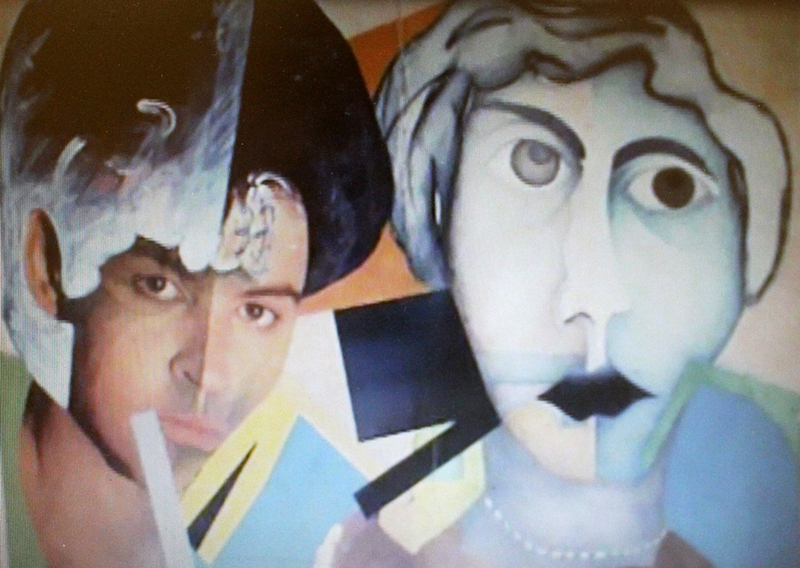 The vision of the two men staring at her became a recurring theme in some of her poster work. She would buy posters and manipulate them with other media eventually producing a vast body of work. At the end of the presentation she had a question and answer session with the artists and a lot of interesting interrogations popped up. Here you had old-timers like seasoned painter David Chibwe, active since the 1960s engaging in debate alongside youngsters such as Ngoma Award nominee Mulenga Mulenga, a prolific young painter barely in her early twenties, who is slated to be the next big thing among female Zambian artists alongside her contemporary Gladys Kalichini with whom she was a finalist for the Julia Malunga Award last year. Chibwe asked Dobereiner for her take on why artists turn to abstract art from the realistic presentation. The Canadian professor answered the question from her own perspective and personal experience. “You are not the same person through time. I think that its when one changes environment, viewing my own reality, I think that’s why I changed I moved continents and had different exposure I think a lot of artists can change, it’s because they want to grow,” she responded. Mulenga on the other hand raised a concern from an apparently persecuted stand point and innocently shared with the professor and the audience that as an upcoming artist she is often questioned when she renders her work in an abstract format. But William Miko, professor at ZAOU and coordinator of the talk too came in with a response to the now open discussion. He likened the progression from realistic to abstract art to that of biological development in the human body and that when the time comes for one to change their style it comes naturally. Dobereiner has returned to Canada but should be back in Lusaka at ZAOU for a longer period. 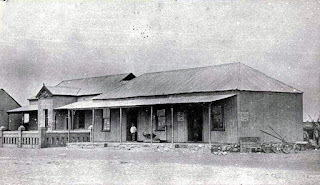 Her discourse at the Henry Tayali reaffirmed Zambian visual artists’ enthusiasm to engage in theoretical debate outside studio work, such as could be observed at the Arts Academy without Walls (Lusaka show grounds) in its formative days, bringing together trained and self-taught artists alike. For some reason, these debates are no more. Apart from the University of Columbia, Dobereiner has also taught at the University of Alberta and the Emily Carr Institute of Art and Design, she has also been the recipient of at least five academic awards and has numerous transcontinental gallery exhibitions. On July 31 this year the city of Lusaka turns 100 years old and preparations for the centenary celebration are already underway. In a press briefing at the Southern Sun hotel in Lusaka on Thursday, the celebration organisers, a team called Lusaka 100 committee headed by Tourism Board chairperson Timothy Mushibwe announced that while the event will involve various activities, the visual arts will take centre stage with numerous arts activities at several venues. The committee announced an art competition for primary schools where children will be challenged to paint an interpretation of present day life in Lusaka, this will culminate into an art exhibition, whereas a mural competition is being planned for secondary schools. This particular project is expected to leave a lasting image that will beautify the city as well as commemorate the centenary for years to come. Street children will not be left out and their competition will be organised by the Start Foundation, the winning pieces in this competition will also be shown in an exhibition at a venue yet to be arranged. Two photography competitions are also planned. One is open to the general public with the theme “A Day In The Life Of Lusaka” where all the city’s photographers are challenged to capture images of Lusaka in her complexity on a single day. This will end in both an exhibition and a book. The second competition, Lusaka Centenary Press Photographer of the Year will target media photographers. The theme again remains Lusaka but with more of a political, socio-economic, arts and sports emphasis. This competition will have winners and prizes in various categories; it too will result in a book as well as an exhibition at the Alliance Francaise in Lusaka. A fashion show is also being planned, showcasing the work of Lusaka’s top designers as well as the elegance of the city’s top models. This is expected to result in a beauty pageant with a Miss and Mr Lusaka 100 being crowned. One of the interesting highlights of the celebration will be a display of historical images and memorabilia at the Lusaka National Museum. However, here, one hopes some of the artefacts and memorabilia will find its way out of the museums vaults and that others can be provided by members of society who have some in their care as the current display at the museum is not much to write home about. Theatre too will be featured in the celebrations although the committee is still working on the concept as well as seeking out collaborating partners and theatre groups. All these arts activities will be held in various venues across the city but Cairo Road will be the stage for a momentous celebration. The celebrations will start at dawn with a running and walking marathon which will begin and end at the Kafue Roundabout. This will be followed by what the committee is calling the Malasha Bike Race. Competitors will race from South End Roundabout to Church Road Junction and back again, each bike will carry three bags of charcoal. Again here one feels charcoal might not be the best ingredient for a race in this era of environmental advocacy where although alternative fuel sources are yet to be saught, there is a lot of talk against the chopping down trees for charcoal. So imagine 100 bicycles with 300 bags of charcoal in one space, would that not be a spectacle indeed. However, The Wildlife and Environmental Conservation Society, with their school-based Chongololo Clubs and in association with Toyota Zambia, will embark on a tree-planting campaign in the ten days running up to the July 31. Nevertheless, the Malasha Bike Race will be followed by an exciting vehicle parade led by a procession of vintage cars, rally cars, off-roaders and motorcycles. The car show will be followed by a float procession, giving the event a carnival feel. The committee is calling on everyone from schools, sports associations, voluntary organisations, business houses and government departments to come out in numbers and take part in this event. The event is expected to incorporate a food festival as well with wine and cheese tasting with the city’s top hotels and restaurants working with food producers. Also on the schedule are a number of sporting activities across various disciplines from equestrian to football. The event is expected to end with a live music concert which is likely to feature an international musician that will be open to all, although a venue is yet to be decided, this will be concluded with a fireworks display. The committee also sees the celebrations as an opportunity to mend a few broken and run down aspects of the city. In conjunction with the National Heritage Conservation Commission, a project involving highlighting Lusaka’s heritage sites and the rehabilitation of the access road to the former home of Dr Kenneth Kaunda in Chilenje as well as refurbish his old Land Rover. The front of the Post Office too is earmarked for rehabilitation and Lafarge Cement has committed to assist in this regard. 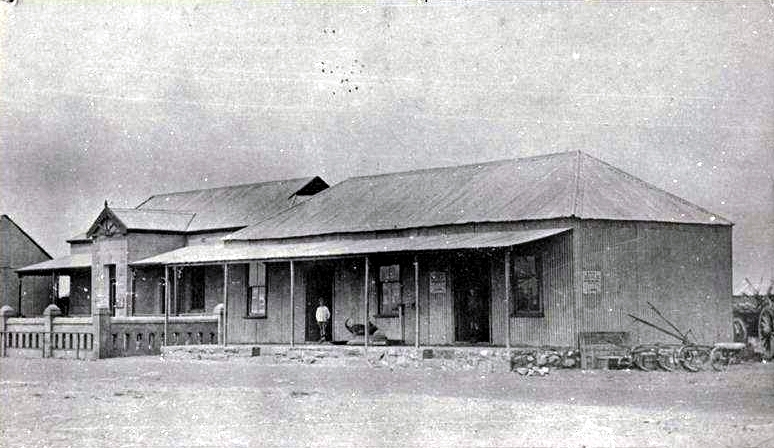 Present day Lusaka sits on the site of a village named after its Soli headman Mwa Lusaka, the area was expanded by British settlers in the 1900s with the building of the railway by the British South Africa Company, scores of the Soli people were displaced moving them further into the countryside. Their current traditional leader Senior Chieftainess Nkomesha Mukamambo II was present at the launch of Lusaka 100 and spoke very passionately against the lack of respect for traditional heritage in the name of urbanization, she also hinted towards seeking reparations for the displacement.